The triathlon of dog sports. This is where our true passion is. Tracking, Obedience and protection. We’ve got you covered in the most exciting dog sport there is from selecting your dog to SchH3 and beyond. Call us today at 619-726-4813. Schutzhund was developed in Germany in the early 1900s as a breed suitability test for the German Shepherd Dog. It was designed to test the natural instincts of the breed and to weed out the dogs that were either unstable or untrainable. This helped ensure that breeding stock would pass on the most desirable traits to working dogs such as police dogs, military dogs, and search and rescue dogs. Over the past century Schutzhund has remained a breed test but has also evolved into a sport that can be enjoyed by people of all walks of life, from new dog owners to seasoned competitors. In many countries, Schutzhund titles are still considered prerequisites for breeding rights, and in some countries Schutzhund is called “The Versatility Test for Working Dogs.” It offers an opportunity for dog owners to compete with each other for recognition of both the handler’s ability to train, and the dog’s ability to perform as required. Persons of all ages and even those with significant disabilities are able to participate and enjoy the sport. Often it is a family hobby. 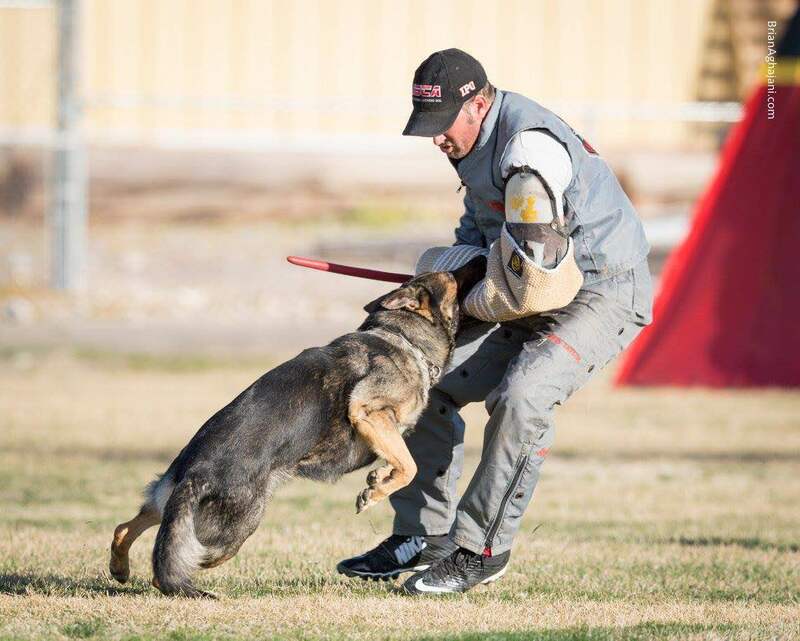 Contrary to the popular misconception that Schutzhund is “all about protection,” it is actually securely founded on obedience and control of a dog’s natural instincts and drives. Schutzhund dogs are safe, stable companions in the home and in public, good with children, under control, and at peace with their surroundings. A Schutzhund trial begins with a temperament test for all entered dogs, where the handler must walk the dog through a crowd of strangers, and the judge observes the dog’s reaction to being approached closely on a loose leash. Dogs that show shyness or aggression are dismissed from the trial. This basic temperament test is repeated and must be passed before each trial. This helps to ensure that the dog is safe with strangers and in a crowded situation. 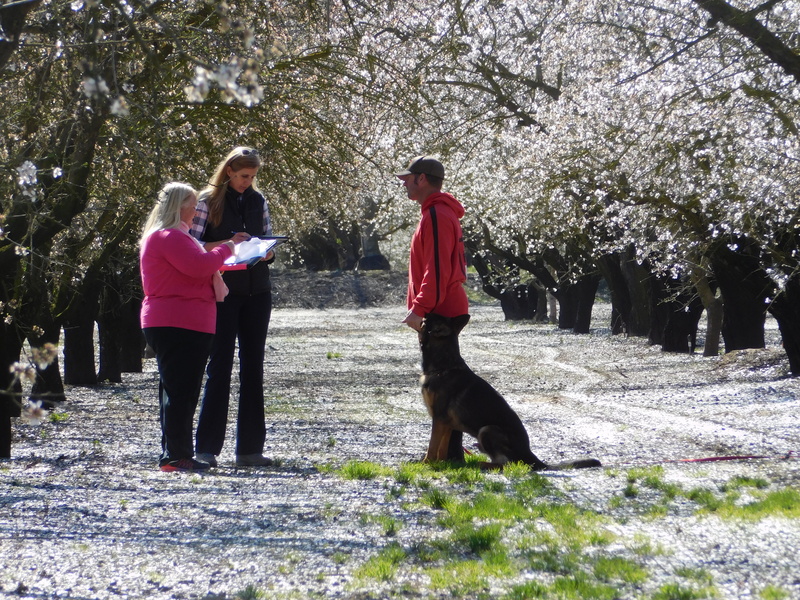 The three parts of a Schutzhund trial are tracking, obedience and protection, and the dog must receive passing scores in all three phases to be awarded the title at a trial. Dogs that are out of control or show sound sensitivity are dismissed and this is noted in their scorebook. Dogs that show aggression towards other dogs may be dismissed as well. Tracking in Schutzhund is sometimes referred to as “footstep tracking.” The dog is required to keep his nose on the ground the entire track and locate certain articles strategically placed on the track. A Schutzhund 1 track is laid by the handler, approximately 300 paces long, and aged approximately 20 minutes. The most advanced tracking titles are over 1800 paces, aged for 3 hours, and involve complex angles, varying surfaces, and are laid by a stranger. 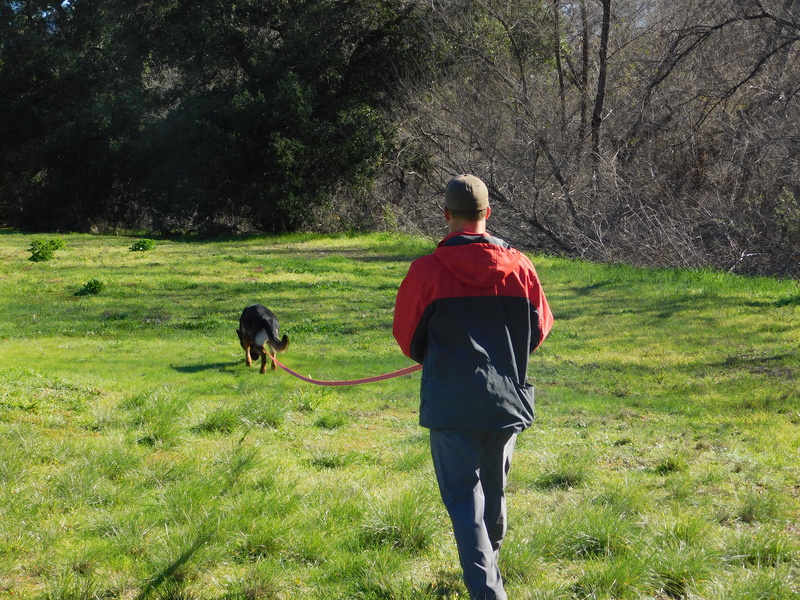 Tracking is a test of the dog’s ability to concentrate on a single task for extended periods of time, and independence in solving problems, as the handler must be 33 feet behind the dog. The working out of the track must be methodical and precise. The obedience phase requires many of the same exercises that are seen in other venues, such as heeling, sits, downs, and retrieves. 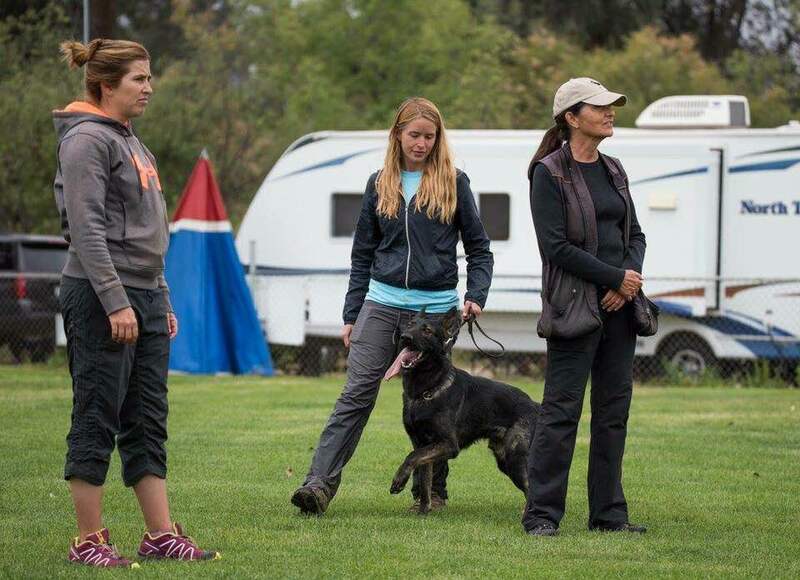 In a Schutzhund routine, the paired handlers must report with their dogs off leash. One dog performs a long down while the other does the routine. During the heeling pattern two shots are fired from a starter pistol to test the dog’s sound sensitivity. Later the dog must be heeled through a moving group of people. Dogs must retrieve large dumbbells on flat, over a 1 meter jump and an A Frame, and must be under voice control with no hand signals. Handler help is penalized, and may result in dismissal from the trial. The protection phase tests a dog ability to react appropriately and be under control at all times. The dog must find a hidden decoy and hold him in place with strong barking without a bite. The dog must return to the handler when called, prevent escapes and attacks by biting, yet be able to immediately release the bite and bark or sit quietly at the handler’s side. The dog and handler are required to heel next to the decoy, and transport him to the judge, yet remain ready for defense against an attack. Dogs that are out of control are dismissed, as well as dogs that do not release the bite. Recently it has become possible to obtain titles in single phases, and a new Rescue Dog suitability title can be obtained at some trials. Rules for Schutzhund titles are based on internationally accepted rules. Judges are often brought from Europe, and The United Schutzhund Clubs of America maintains a judges program as well, licensing judges from within the organization. United Schutzhund Clubs of America has developed a certification program for helpers, and nearly 400 have participated. This program involves attending seminars given by national teaching helpers, as well as written and practical testing of the helper’s skills. A helper must demonstrate proper equipment, an understanding of the rules, and most importantly, the ability to move and catch each dog safely. Helper classifications range from basic to national levels, and after each trial, a helper’s performance is critiqued by the presiding judge, and noted in his Helper Book. This promotes fair testing of the dogs and vigilance with regards to safety. USA also offers conformation shows, where the physical attributes of a dog are judged against the international standard. Dogs may be shown as puppies, allowing a chance for those with very young dogs to participate, and classes extend up to adult dogs with Schutzhund titles showing in the conformation ring. This promotes breeding for correct and sound physical structure. Breeders are encouraged to adhere to strict standards, involving a show rating, a Schutzhund title, an endurance test, and an acceptable hip rating on each dog being bred. In many countries, litter registration is not permitted unless the parents have met these criteria. This promotes consistent quality of the dogs being bred, and allows potential buyers to review generations of hip ratings, conformation, and working titles. In America, USA is a strong proponent of this system, which originated with the SV in Germany. Why is Schutzhund important to the future of the working breeds? A dog that performs well in Schutzhund should demonstrate a solid temperament with a foundation of intelligence and utility. He will show a high level of trainability and happiness for his tasks. These traits are highly sought after in police K9s and Search and Rescue dogs. By participating in Schutzhund, we are keeping an important genetic pool alive for the dogs which serve and protect us. It also allows owners opportunity to enjoy an internationally recognized sport with their dogs, creating a stronger bond, and a safe, well mannered member of society. Copyright – United Schutzhund Clubs of America (USA). Reproduction in whole or in part permitted with proper attribution to the USA. Article written by Christine Gajda of the USA’s General Education Committee. © 2018 Taylor Made Working Dogs. All Rights Reserved.